Democrat Gretchen Whitmer is trying to paint her Republican opponent Bill Schuette as a supporter of the 2011 law that raised taxes for many retirees. Michigan gubernatorial candidates Gretchen Whitmer and Bill Schuette both promise to repeal the so-called “pension tax,” which has cost retirees nearly $300 million per year since it was approved in 2011. Whitmer, a Democrat, voted against removing the exemption to the income tax while she was in the Senate, and now has released an ad that claims Schuette, a Republican, supported legislation that created the tax. Because the ad omits crucial context, we rate it misleading. Does Bill Schuette care if sick people can get insurance? The ad was released Sept. 25 and is authorized by the Whitmer campaign and funded by the Democratic Governors Association. The ad laments tax changes that gave businesses a big tax cut while exposing more of retirees’ income to the state income tax. To support Whitmer’s claim, the DGA pointed to Schuette’s comments in October 2011 at a Republican women’s group meeting in Frankfort. “We put a stake in the heart of the Michigan Business Tax, and that’s done. That’s great news for Michigan taxpayers,” Schuette said, according to the Manistee Advocate, which had a reporter there. The Whitmer ad focuses on that last phrase – “That’s great news for Michigan taxpayers.” She doesn’t specifically say he supported the changes in how pension income was taxed. But the implication is there. Schuette advocated for the elimination of the MBT, which levied a nearly 5 percent business income tax. It was scrapped in 2011 through sweeping changes that cut businesses taxes by $1.65 billion and increased personal income taxes by $1.42 billion. Deductions for retirees, which shielded most pension income from the income tax, were reduced under the bill that passed the state House 56-52 and deadlocked in the Senate 19-19, with Lt. Gov. Brian Calley breaking the tie, allowing it to pass. Whitmer was among those who voted against the bill. So did several Republicans, including Sen. Jack Brandenburg, R-Harrison Township, who said he wanted to eliminate the Michigan Business Tax but couldn’t support the legislation because of its impact on retirees. Schuette was attorney general at the time and didn’t vote. At his speech in Frankfort, Schuette voiced no qualms about the tax increase or any mixed feelings like Brandenburg, said Turner of the DGA. Turner could point to no other instance in which Schuette publicly praised the bills, the elimination of the Michigan Business Tax or raising income tax on retirees. That’s because they don’t exist, John Sellek, a Schuette campaign spokesman, wrote in an email to Bridge. 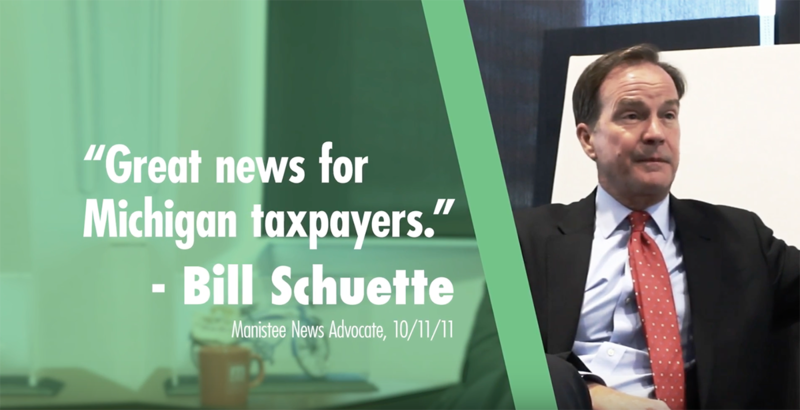 No one disputes that Schuette once, with a reporter present, praised the elimination of one tax that was made possible by raising other taxes. Does that mean Schuette favors raising taxes on retirees, as the ad suggests? Hardly. In fact, Schuette has a long record of opposing taxes, fought to preserve the pensions of Detroit police and firefighters from cuts during the city’s historic bankruptcy – and is campaigning to repeal the retiree tax. So is Whitmer. It’s one area of common ground among the candidates, but you’d never know it by watching the ad. If anything, it gives the impression Whitmer is the anti-tax candidate, when she voted to increase several taxes while in the Legislature, including the state income tax, Michigan Business Tax and extend the sales tax to more services (a decision repealed shortly thereafter). The ad follows an all-too-familiar formula during campaign season: Highlight one true statement, ignore all counter evidence and lead voters to a conclusion that is misleading. Any discussion about shielding pension income from state income taxes needs to be expanded to include all "retirement" income such as income from IRA's and 401(k)'s. Otherwise, this is a favor mainly to unions and further serves to divide us - treating most private sector retirees differently than public sector employees. They can even consider putting a cap on the amount subject to exemption to control the budget impact. Someone with a $100k pension doesn't need a full exemption. Why should any income be shielded from income tax? As you said it just divides us. It is a total fallacy that retirees are poor. They are the wealthiest demographic group and have the least dependents to support! Any changes to taxes on pensions should equally to 401k and similar retirement accounts. I will certainly remember any politician that votes to remove taxes from pensions but not from my 401k. Great ad on pension taxation. Yes, let’s eliminate taxes from the wealthiest group. I mean we can get back to paying no tax on retirement savings worth millions. I just love the way Dems think.